The equation between Nawaz Sharif and Imran Khan more or less decided everything else in the country from 2013 onwards. In the photograph above, Nawaz Sharif is seen here visiting the Banigala residence of Imran Khan in early 2014 in order to build a consensus on security issues. Just months later, the only consensus between the two was on not having a consensus over anything. IN July this year when the editorial team at Dawn commissioned a series of special reports on the 70 Years of Pakistan, it chose topics that one would expect. An article on the Founding Fathers, on Ayub, two on Bhutto, one each on Zia and Benazir, and so on. It had planned the series well before commissioning specific writers, and at a time when Pakistan’s politics was probably settled and secure in the leadership of prime minister Nawaz Sharif who was looking forward to an imminent fourth term following the elections next year. The last theme chosen by the Dawn team, to which this essay responds, was, surprisingly, the very prescient ‘At the Crossroads’. There is no way that in July, the editorial team could have predicted that by the end of the year, Pakistan might, indeed, be at a major ‘crossroads’ yet again. Clearly, the team knew something I didn’t, or had a crystal ball which told them the future. Either that or they played into the permanent cliché which defines Pakistan’s politics, its economy and society, that Pakistan is forever at some crossroads or the other even when things seem quite settled and appear to be going well. 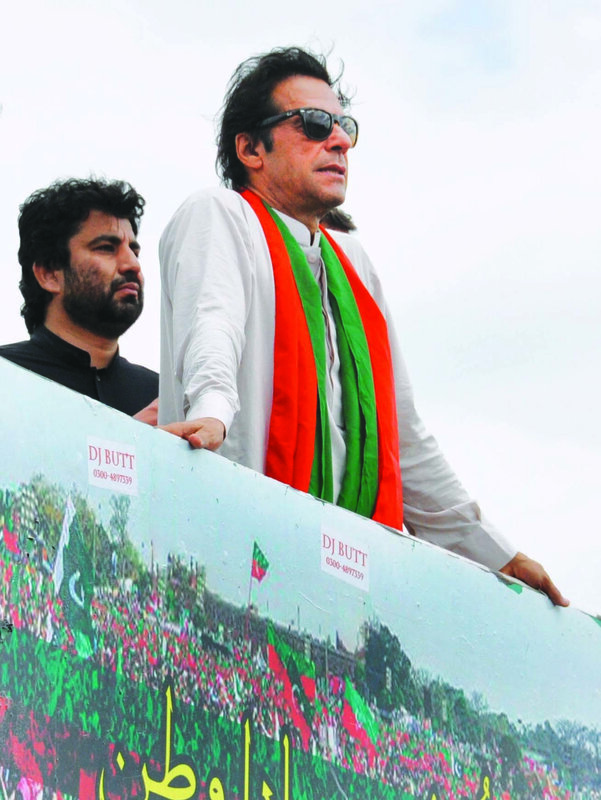 The supporters of Pakistan Tehreek-i-Insaf (PTI) popularised – almost legitimised – the sit-in, holding the federal capital hostage for any uncertain stretch of time. It is this particular unknowability, or the permanence of being stuck at the crossroads, which, for many political and social observers, defines Pakistan. Apart from these themes, there are pundits who are always finding ‘fault lines’ somewhere in Pakistan’s present, while others think that Pakistan moves only from crisis to crisis, yet others insist that Pakistan and Pakistanis are ‘resilient’, so bring on another trauma or crisis, and Pakistan will, as they say, ‘muddle through’. There is an ahistorical understanding amongst many writers about how events and processes unfold. For others, who come up with a long wishlist of ‘what needs to be done’, there is absolutely no understanding of material conditions and relations which allow for certain developments to take place. Many react to immediate events without understanding what the causes for such events are, and fail to locate them in their specific context. Historians repeatedly emphasise that context matters, that it is critical. But there is also the converse of this argument, that for social scientists who like to locate their understanding on material and social forces, Pakistan is perhaps one of the most unpredictable places in the world, where events emerge not just to surprise, but to completely disorient our understanding of possible outcomes based on material forces. Social scientists use the term ‘contingency’ for such unexpected events, but in the case of Pakistan, there seem to be far too many. Just three examples from Pakistan’s very recent history would emphasise this point, that there are far too many ‘unknown unknowns’ (the enchanting term coined by Donald Rumsfeld), things which we could not have predicted or put into our calculations. In 1977, or again in 1999, when Generals Zia and Musharraf had taken over through coups dismissing democratically elected governments, one could not have imagined that they would have survived for a decade in power had it not been for unexpected events, both times related to the invasion of Afghanistan. Both December 1979 and September 2001 were not events factored into our social, political and class analysis and understanding of Pakistan, and much of the understanding about Pakistani politics and society was unhelpful in explaining dynamic developments at that time. 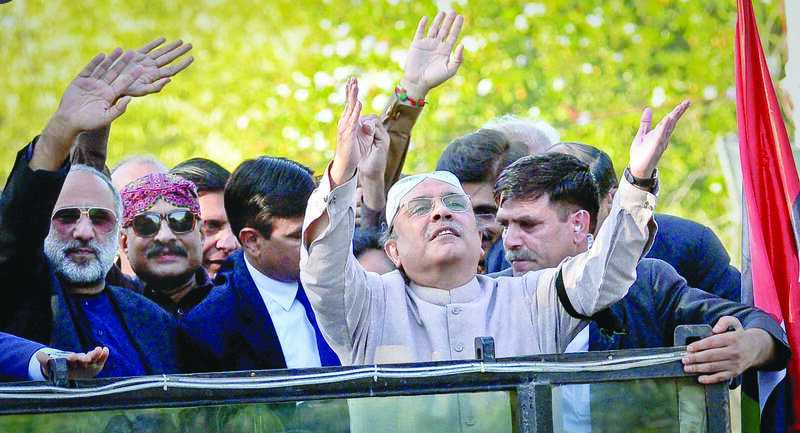 Similarly, no one could have ever imagined that Asif Ali Zardari would be Pakistan’s president, but the circumstances following Benazir Bhutto’s assassination made something as impossible as that quite real. In each of these cases, the analysis by social scientists had to concede to the powerful hand of contingency and we were forced to only react to the events after the event. Pakistan’s past could not have been foretold. There are numerous people, including many scholars, who invoke the past as some ideal and idealised moment, hoping to resurrect it in the context of what Pakistan is today. There are those who want a morality and ethics based on the Prophet and his Companions’ time, arguing that only if we return to the values of that era, will we do justice to our existence today. There are some who repeatedly cite the speeches made by Mr Jinnah, especially his August 11, 1947, speech, arguing that his was the call for tolerance and acceptance of different religious beliefs, if not for an outright call for some vague notion of secularism. In more recent times, there are still a few who reminisce about Ayub Khan’s golden years wishing they were revived, and an even younger generation which wants Musharraf back and extol some of his perceived virtues – however, no one asks for a return of Zia or his times. Yet, none of these historical imaginaries, whether those which are well-intentioned or are ill-conceived, are possible in the current moment, for times, and their material conditions, have changed. A ‘Jinnah’s Pakistan’ is not possible, for we have lived through a Zia’s Pakistan, and, after so many trysts with destiny, find ourselves in the post-Taliban moment. The contexts of such virtues have changed, for they cannot be mere idealistic thought experiments, but need to be examined in particular material social and political contexts. Jinnah’s famous speech was written in far more friendlier times, when around 12 per cent of the Pakistani population belonged to non-Muslim faiths. Today, that number is less than half of that, even after we have added to that list by declaring some communities non-Muslim. The notion of going to ‘your temple or church’ really doesn’t exist as an option after Zia. Pakistan has changed completely from the time of Mr Jinnah, or even of Mr Bhutto. Jinnah would weep at what many generations have done to the Pakistan he created. One of the first things one ought to learn about social sciences and in studying Pakistan is that we do not, and cannot, make predictions. When the 2013 elections were held, the Herald magazine conducted a poll of prominent political and social scientists to make their predictions (based on some analysis, of course) about the elections. In their foolish enthusiasm, many did, and were off the eventual results by not just a few seats, but by factors many times over. IMRAN Khan and his Islamabad sit-in set in motion a movement that had its highs and lows not so much against the government as against the person of Nawaz Sharif, the prime minister. In 2013, the electronic media was giving Imran Khan an almost certain chance to win the elections outright, and while some thought that Nawaz Sharif would win the largest number of seats, I do not recall any analyst predicting an outright majority for the PML-N. Besides, even after his name appeared in the Panama Papers, there were very few analysts who thought that this would result in him being dismissed or disqualified. Predictions, especially about elections and political matters in Pakistan, are better left to astrologers and soothsayers, not to scholars trained in social and political sciences. Yet, we also cannot be so irresponsible or complacent, and not venture forth speculating about the future, having some understanding and learning of material conditions and social processes. One can, at least, analyse class and social forces, look at changing regional and global factors, and, based on this, offer some analysis which, based on present conditions and contexts, would be valid. One cannot control for the unknown unknowns, but we can make sense of where we are and possible future directions. These do not have to have predictive attributes and are merely speculative and conditional as well as contextual. As mentioned above, less than six months ago, an emerging consensus was being formed that a Shahbaz-Nawaz victory looked close to certain in the Punjab and across Pakistan, barring some unforeseen circumstances. Those unforeseen circumstances took shape rather quickly, to become a very concrete case for Nawaz Sharif in the form of a trivial clause about a non-disclosure of an income (which wasn’t even received) at the time of filing his election papers in 2013, to bar him from contesting elections. 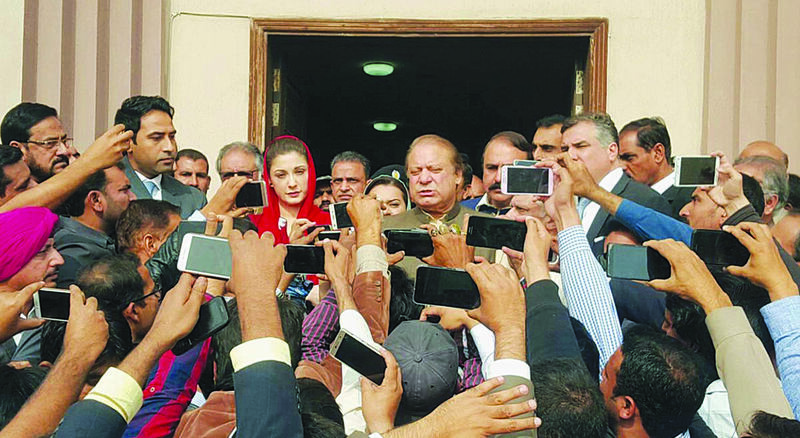 ONCE out of office in the wake of controversy around Panama Papers, Nawaz Sharif and daughter Maryam, among others in the family, had a tough time in and out of the courts. The appointment of Qamar Bajwa as the new army chief, replacing the ever-popular Raheel Sharif, came across as a civilian victory with a smooth transition, clipping the wings of any ambition. Moreover, with the Zarb-i-Azb, followed by Radd-ul-Fasaad, it seemed that the military was finally sincere in breaking the mullah-military alliance. Pakistan’s economy, too, was growing from strength to strength, with growth at a higher rate for every single year since Ishaq Dar became the finance minister, to be the highest in 11 years. Scores of international journals and newspapers were celebrating Pakistan’s transformation into a newly emerging and strengthening democracy with a buoyant middle class, and stabilising and increasing economic growth. Six months, it seems, is a rather long time in the history of Pakistan where so much which was built on since 2008, seems to have unravelled and come undone. WHILE Imran and Nawaz played cat and mouse all through the tenure, the PPP, led by none other than Asif Ali Zardari, played the joker in the pack. Nawaz Sharif has been forced out, Ishaq Dar is sent on leave, and the military has started giving numerous signals with clear political messages. First, there was that exchange with Ahsan Iqbal about a speech given by the COAS about the economy, and then there was the military’s central role in the Faizabad sit-in. What does one make of Pakistan’s future? At the crossroads? Again? Permanently? Despite the recent intrusion into the political sphere by the military, yet again, and the dismissal of Nawaz Sharif, yet again, do not look like a script being repeated from the past. Far too much has changed, and old methods and tactics are unlikely to work. While old forces begin to bring back old politics and tried old methods, new forms of resistance and opposition have also emerged. Even the military is now often challenged, sometimes by the judiciary, more frequently by citizens themselves. 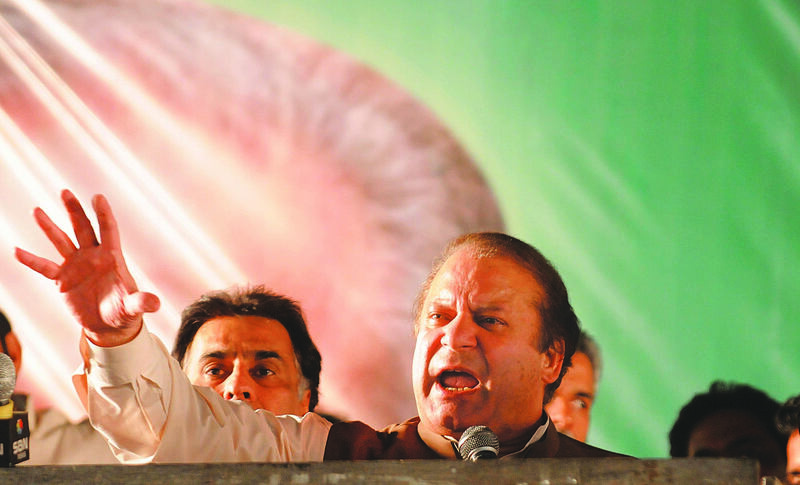 NAWAZ continued to blow hot and cold over his ouster, playing the ‘popularity’ card, but had little relief as his party prepared for the general elections. For the future to change from one which continues to be more-of-the-same, or worse, returns to a discarded and failed model, clearly there is an urgent need for a different politics, a different economics and a better way of living in society. This requires new actors and those who are willing to mobilise on issues which focus on material conditions, and are willing to take bold and necessary steps. After many decades of annihilation, best demonstrated by the fall from grace of the old Pakistan People’s Party, some progressive voices have begun to emerge, organising themselves around causes which are best represented in the form of political organisation. When even liberals are being accused of being ‘the most dangerous group in Pakistan’, the urgency for progressives to unite against mainstream parties cannot but be emphasised. 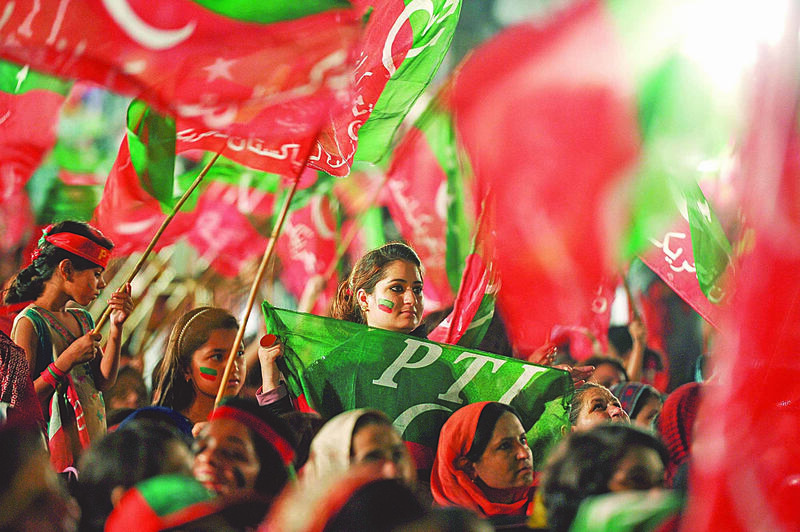 In 50 years, there has never been a better time, or greater need, for progressive politics in Pakistan. It is time now to make a future far different from the pasts we have lived through.